For the actress, see Jane Seymour (actress). Jane Seymour (c.1508 - 24 October 1537) was the third wife of King Henry VIII of England and queen consort from 1536 until 1537. She was the mother of Edward VI of England, who died a the age of 15. Edward was the only male child of King Henry VIII to survive infancy. Jane Seymour was the child of John Seymour and Margaret Wentworth. She was not educated as much as King Henry's wives before her, for example, Catherine of Aragon or Anne Boleyn. She could read and write a little but was much better at needlework and managing the house. These were considered much more necessary for women. Jane's needlework was said to stope beautiful and complex. Some of her work was kept till 1652, where it is recorded to have been given to the Seymour family. After her death, it was noted that Henry was an "enthusiastic embroiderer". She was a lady-in-waiting to Catherine of Aragon, the first wife of Henry VIII. When Henry divorced his first wife and married Anne Boleyn, Jane continued to be a lady-in-waiting. Henry VIII noticed Jane at court and had already fallen in love with her by the time Anne Boleyn was executed. He became engaged to Jane on the day after the execution, and they were married ten days later, on May 30, 1536. When Jane became queen, she ran the royal court in a strict and formal way, and her only close friends were Anne Stanhope and Elizabeth Seymour. In early 1537, Jane became pregnant and developed a craving for quail. In October of 1537, she gave birth to the son that Henry VIII wanted so much. They named him Edward and he was later to be King Edward VI of England. Soon, Jane became very ill with fever, and she died on October 24, 1537. 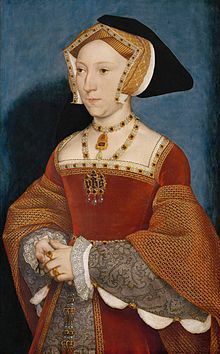 Jane never had a coronation, and was married to Henry for only a year and a half before she died (May 30, 1536-October 24, 1537). Henry had loved Jane the most of all his wives, because she was the one who gave him a son. Even though he was married another three times after Jane's death, he always grieved for her. Before Henry died, he asked to be buried next to Jane. ↑ "Henry VIII - the Embroiderer King". Royal School of Needlework. Retrieved 2009-10-19. This page was last changed on 30 October 2018, at 14:09.